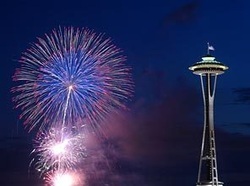 WHAT: Widmer Brothers Brewing Presents New Years Eve CelebrationBrrring in the New Year at Mt. Hood Meadows presented by Widmer Brothers Brewing. Meadows After Dark gets a little more brilliant under bursts of fireworks! The night will include night riding, a splendid dinner buffet, a New Year's Eve party, live music and fireworks! Tickets will be available online in December. Ring in the New Year by skiing and riding until 2 a.m., following an amazing fireworks display at midnight. The famous Space Needle will once again display the world's tallest structure-launched Fireworks Show with more than 2,000 Pyrotechnic Effects this New Year's Eve ... the base of the Space Needle will host the West Coast's version of New York's Time Square as more than 50,000 people gather below to watch the Fireworks shoot across the mid-night sky with an estimated 400,000 viewing the show from surrounding neighborhoods.